Q: How do I select the correct power unit for my new home? Ans: Add the total square footage for each floor of your home, including the basement and garage. If it's within 10% of the rated cleaning ability of the power unit, we recommend that you select the next larger canister to insure optimum cleaning power. Q: Where is the power unit typically installed? Ans: The power unit is typically located in a utility room, basement, or garage. Q: Does the complete system have to be installed at one time? Ans: No. Some homeowners choose to rough-in the tubing system when a home is being built and then complete the system by adding the power unit and inlet valves at a later date. Q: Do systems need to be exhausted to the exterior? Ans: True Cyclonic Systems must be exhausted to the outside. Filtered Cyclonic Systems do not. Q: Will I need an inlet valve installed in every room? Ans: No. For maximum cleaning convenience and whole-house coverage, inlet valves are strategically placed throughout the home. Typically, one inlet valve will cover 600 sq. ft. of living space. Q: What is the standard height for installing the inlet valve? Ans: Valve height varies with the height of the finished baseboard being used. Q: How much tubing should I figure per inlet valve? Ans: Each valve will use approximately 20' of tubing. Q: How many square feet will one valve cover? Ans: One valve will cover 600 sq. ft. of living space. This estimate is based on using a standard 30' hose. If a shorter hose is used, more valves are required. 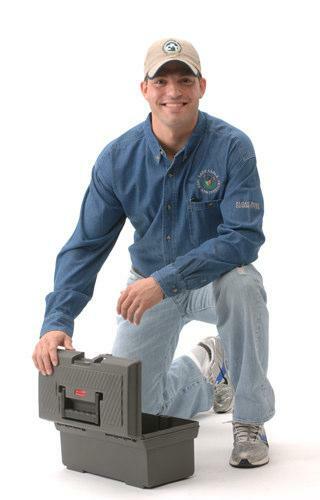 Q: How long does it take to install a Central Vacuum System? Ans: Installation will vary depending on the number of inlets required in your new home. Q: My central vacuum has lost a lot of its suction. What is the most likely cause? Ans: Possible causes of poor system performance are dirty filters, leaky inlet valves, blocked intake or exhaust pipes or a clogged system hose. Q: Why does my system keep running even when my hose is removed? Ans: The most likely cause is a faulty relay circuit board, which would need replacement. 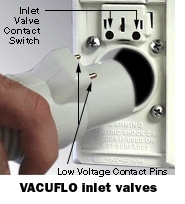 The Vacuflo Inlet Valve's low-voltage contact switches are above the valve opening. The low-voltage connection is made when the lowvoltage pins on the hose are inserted into the contact switch. The Universal Inlet Valve's low-voltage contact switches are inside the valve opening. The low-voltage connection is made when the lowvoltage ring on the hose connects with the brass contact switches inside the inlet valve. 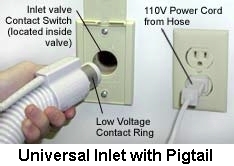 Universal Inlet Valves support electric powerheads and hoses only with a pigtail cord. 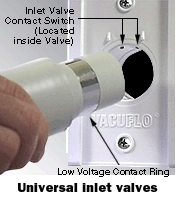 The Direct Connect Electravalve 110V contact switches are above the valve opening. The electrical connection is made when the pins on the hose are inserted into the contact switch. 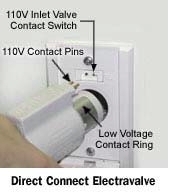 Direct Connect Electravalves support electric powerheads and hoses.